We aim to build patient-specific Logic models of the signaling networks of prostate cancer patients, and use them to develop novel combination therapies. Translation of high-throughput technologies into therapeutic advances in the clinic still poses considerable challenges. These include tumor heterogeneity and the integration of multiple types of molecular data into predictive mathematical models. Prostate cancer, for example, presents an evident clonal diversity, and it is an urgent clinical need to distinguish the many indolent tumors from the minority of lethal ones. The European H2020 PrECISE (Personalized Engine for Cancer Integrative Study and Evaluation) project aimed to improve patient risk-stratification and treatment in prostate cancer by developing new computational approaches that exploit molecular, clinical and prior knowledge biological data. 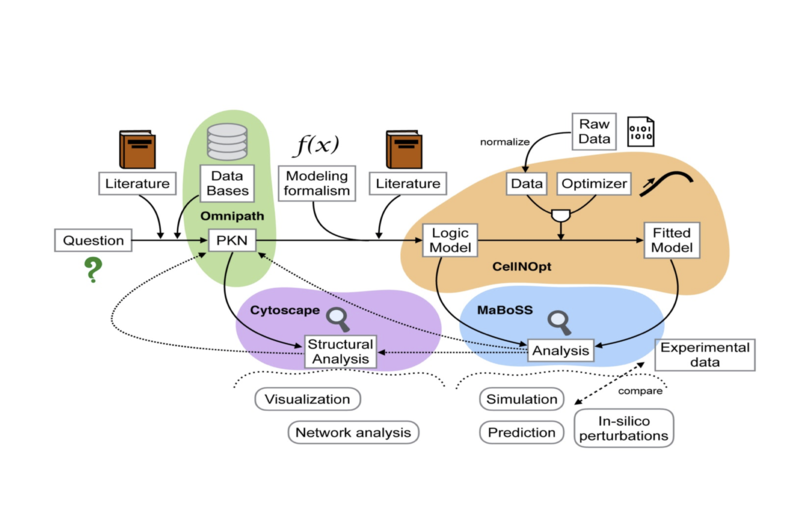 Building upon our experience on pathway resources and modeling, we worked on the integration of prior biological knowledge with different types of molecular data and its translation to actionable mechanistic models. These models were used to identify mechanisms of disease and treatment. In particular, we used our approaches for logic modeling to model, draw inferences and make predictions about cell signaling pathways relevant to the biology of prostate cancer. As part of this effort, we focused on the study of how signalling in important pathways (e.g. the PI3k pathway) changes when prostate cancer cells become resistant to enzalutamide treatment. For this, we used proteome-wide phosphorylation data acquired using SWATH technology by our partners at ETH Zürich (R. Aebersold) and University Hospital Zürich (P. Wild) and a comprehensive prostate cancer logic model developed in collaboration with the Curie Institute (L. Calzone). The overall workflow to tackle this modelling challenge was described in Traynard et al. (2017). We are currently preparing a publication that will summarise our findings. Workflow suggested for applying logic modeling to build sample specific models that allow simulation of therapeutic interventions (Traynard et al., CPT Pharmacometrics Syst. Pharmacol., 2017). Traynard, Pauline, Luis Tobalina, Federica Eduati, Laurence Calzone, and Julio Saez-Rodriguez. 2017. “Logic Modeling in Quantitative Systems Pharmacology.” CPT: Pharmacometrics & Systems Pharmacology 6 (8): 499–511. https://doi.org/10.1002/psp4.12225.